How to teach history in a multicultural and multireligious environment? The project - which started in a difficult period of tension and violent conflict for the country, at the time of the Russo-Georgian confrontation over South-Ossetia - focused on the professional development of Georgian history educators. The participants were invited to put more emphasis in their work on the history of everyday life and on concepts such as migration, gender, mutual inclusiveness, human rights, diversity and environment. A concrete outcome was a student-centered teaching tool on topics related to Everyday and Family Life, Religion, Migration and Multicultural Life in Georgia in the 20th century. To support the regional development of History and Citizenship Education in a multicultural and multi confessional environment. To further and improve the quality of history education in Georgia in line with the national educational reform policy, encouraging innovation and professionalism and through contributing to the lifelong learning of history educators in the region. To promote national, regional and international intercultural dialogue by co-operation, communication and networking of history educators. To contribute to participatory governance, management innovation through professionalisation, effectiveness, and sustainability of the member organisation and by individual capacity building of history educators. A group of 35 authors and editors with diverse backgrounds developed the teaching tool How We Lived Together in the 20th Century in Georgia. 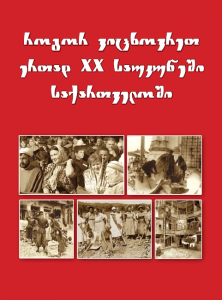 The book is a collection of 29 modules offering innovative sources and teaching ideas for the classroom on topics related to Everyday and Family Life, Religion, Migration and Multicultural Life in Georgia in the 20th century. The modules were piloted in 24 schools across the country and reviewed by an expert on textbook research from the Georg Eckert Institute in Braunschweig, Germany. 2000 copies were disseminated in schools, universities and libraries to be widely accessible to history educators. The book comes along with a 150-page teachers’ guide indicating for each module the compliance with the national curriculum. 321 Georgian history educators were involved in project activities, most of them on a regular basis. 9 national training seminars and workshops took place in five different regions in Georgia. Moreover, more than 20 trainings were organised on a local level. The project significantly increased and improved the professional capacity of the individuals involved who became more able and eager to address untouched topics in history, perform innovative methodology and pedagogy, cooperate and share their knowledge with colleagues at the local, national and regional level. Participants received capacity building training in the form of interactive workshops, lectures and group works by 14 invited international experts from various fields such as innovative history didactics, pedagogy, intercultural communication, history of the region and textbook development. 24 Georgian history educators participated in international trainings in Armenia, Bulgaria, Cyprus, Germany, Greece, Latvia, the Netherlands, Poland, Turkey and the UK. Educators participating in activities abroad gave oral and written feedback upon return, thus allowing a wider group to learn from their experiences. 19 history educators from Armenia, Azerbaijan, Russia and Turkey participated in project activities as regional observers, benefiting from the trainings, sharing their national experience with Georgian colleagues and establishing bilateral and multilateral relations. As a result, two new History Educators’ Associations, the Public Union of the Azerbaijan Historians and the Union of the Armenian History Educators were created and asked for EUROCLIO membership in 2010. The Georgian Association of History Educators (GAHE) grew from 30 members in 2008 to almost 300 in 2011, as a result of the setting up of regional branches and a professionalised membership policy. The GAHE branch in Ajara opened a Centre for Methodological Training in History Education at Batumi State University. In Kakheti and Samkhste-Javareti, study rooms for history teachers and their students were created or reactivated in 3 schools. GAHE published two volumes of its magazine on history education, Istorikosi, launched its website, and developed partnerships with other civil society organizations in Georgia.